In 2010, new offences were added to Australia’s Migration Act 1958 (Cth) and Criminal Code (Cth) to criminalise financially supporting the smuggling of migrants. Further reforms followed in 2011 to prevent and suppress the use of alternative remittance systems to finance migrant smuggling. These measures have significant implications for Australia’s migrant communities who frequently use the informal financial sector to support their families in their countries of origin. It is also not uncommon for migrant communities to provide the funds that will enable future migration of their relatives. This article explores and analyses the relevant laws designed to combat the financing of migrant smuggling and reflects on the actual and potential impact on the remittance flow between diaspora and home communities, and the ability of the legislative and regulatory measures to reduce the levels of migrant smuggling to Australia. Jury directions in relation to the issue of consent in trials of sexual offence cases are mandated in two jurisdictions in Australia (Victoria and the Northern Territory). The Australian Law Reform Commission, in conjunction with the New South Wales Law Reform Commission, has recommended that provisions similar to those in Victoria should be contained in relevant legislation in all States and Territories. However, a recent series of cases in Victoria has revealed significant problems in relation to the mandatory jury directions. These difficulties have generated increasingly elaborate and complex directions. The complexity of these directions not only presents considerable challenges for judges but also may overwhelm, rather than assist, members of the jury. The Court of Appeal of Victoria has called for “urgent and wholesale reform”. In the light of these concerns, it is suggested that the Victorian mandatory directions do not provide a model for other jurisdictions. Rather, the Victorian experience can be seen as a cautionary tale of the problems and pitfalls of such directions. Recently, the Victorian government has passed the Jury Directions Act 2013. This Act sets out “guiding principles” that should determine the content, and use, of jury directions. These guiding principles should form the basis for any jury directions with respect to sexual offences. The offence of using a mobile phone while driving limits the behaviour of a large proportion of the population. Attempts to achieve broad compliance have involved extensive public safety campaigns supported by high levels of police enforcement activity. However, as a summary offence it has been rarely considered by the higher courts. Despite being procedurally summary in nature, it is very complex, and there are significant questions over the correct interpretation of key concepts. Largely, this is due to the difficulty in defining exactly what form of behaviour is prohibited in an environment where technology is rapidly changing. This article provides a detailed analysis of the elements of the offence, highlighting areas of uncertainty and alternative interpretations. It provides a critique of the reliance on technological forms as a way of defining the prohibited behaviour, showing how amendments to the offence have struggled to keep pace with changing technology and driver behaviour. 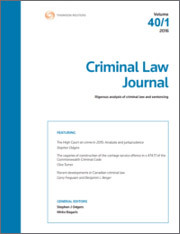 For the pdf version of the table of contents, click here: WAU – Crim LJ Vol 38 Pt 5 Contents.